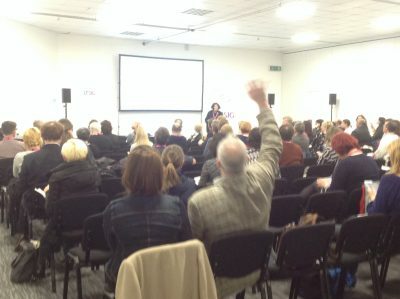 The LTSIG Showcase Day was held on the 10th of April at The Brighton Centre featuring 7 key speakers who shared interesting talks on incorporating online tools that could empower teachers to deliver better teaching experiences overall, writes Elisa Effendy. Jennifer Dobson began the day by outlining the teacher’s role in facilitating the online experiences of primary school learners. She detailed some facts regarding learners and technology at different life stages from the perspectives of both children and parents, before sharing insights into real life cases and solutions we can adopt in the classroom. Sharon Hartle tackled the misconception that using Corpora is outdated by presenting practical tools such as Just The Word and Wordandphrase that are more user-friendly and helpful for both teachers and students. She emphasised the importance of using corpora instead of dictionaries when it comes to sentence usage. Why? Because students tend to be lexical magpies who merely learn words without actually being able to use them. Sharon then demonstrated the step by step ways to use tools such as Just The Word. The third speaker, Mohammad Etedali, started his talk with an open question to all attendees on any source of problems they have encountered whilst using digital tools in their teaching. Four different kinds of 21st century literacies were discussed, i.e. Basic, technological, visual and information. For instance, our students take information on the internet at face value with little or no critical thinking – hence the need for full awareness of such digital literacies. He also suggested some pedagogical frameworks for developing L2 writing skills. Shaun Wilden came up with the idea that some students actually exit their lessons at some points during the lesson, with possible causes such as the fear of failure or simply becoming disengaged when teachers say such trivial things as “Hands up if you..”. Referring to his book called ‘Mobile Learning’, he talked about some ways mobile phones could help teachers prevent this problem, for example, by utilising mobile phones in activities that utilise the target language. Simple features and apps like cameras, Whatsapp or Kahoot for instance, can be explored to engage and give meaningful exit tickets to students. Christina Giannikas talked about her study on The Facebook Effect in eLearning programs, particularly in improving communication, collaboration, and even strong community among students and teachers. She also gave some academic examples of integrating Facebook. Yet another enlightening topic followed, presented by Deborah Healey, which focused on Gamifying your Classroom. She first clarified that Gamification isn’t about using games but about adding game elements to ordinary classroom activities to create a novel feeling and achieve such goals as enhanced motivation and engagement. Language teachers have already used some game elements in their classes, yet it’s time to add “game thinking” and “players”. For instance, Collaboration Points (CP) could be used in addition to individual Experience Points. These were indeed creatively discussed as Deborah passed on Game Mechanic worksheets to the participants to encourage discussions surrounding the practical application of each game mechanic. I personally found this workshop to be very useful, as the application could be as simple as using a cooler name like ‘Quest’ instead of ‘Project’, or more subtle ones, like the issue of topics’ ownership and students’ recognition. Last but not the least, the Showcase day was closed by Gary Motteram‘s talk on developing mobile teaching materials for challenging circumstances. The focus is on Syrian English teachers who work in the refugee camp in Jordan, with very limited access to the internet, hence the need for materials that work both online and offline. A simple tool like Whatsapp is very useful as it allows communications through different kinds of media like text, audio, videos, pictures, that come in handy for people who people who wish their work to remain private online. While Whatsapp is good for a wrap-around tool, Gary found ways to actually create materials that can be easily accessed offline. He came across an open-source Android app called Ustad Mobile (which means ‘Teacher’) that enables teachers (users) to download the materials beforehand and once they come into the classroom, it finds and automatically updates the app, so no internet connectivity is needed. Some softwares like EXE could be used to create digital content as EPUB files so we can access the app in Apple’s iOS or other technologies other than Android. Gary then talked about another great open-source app called HSP that allows us to create and add materials from Moodle, webpages and others into this app. His presentation ended with a simple demo of how HSP works, including useful tools like drag and drop, drop-down, clear the gap that could all be used for different tasks in listening, reading and writing. Although this app is still being developed, the talk and Q&A session at the end definitely generated interest in developing mobile teaching materials for the unprivileged. The day was eventually closed with a refreshing LTSIG Open Forum which featured some of the great personnel behind the LTSIG committee, along with the ongoing and upcoming events and of course, a networking session with some nibbles, wine, and freebie books that no one can resist!